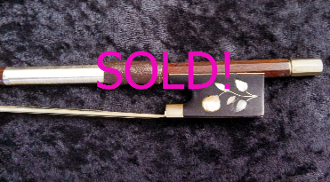 This full size violin bow for sale is a fun one, indeed! It was made in a shop in Germany c 1920 and is quite fun. The ebony frog has a flower inlaid in abalone and a nickel mounting. The round brazilwood stick has striping painted on so as to appear to be made of snakewood. The bow is straight and strong with no signs of warping. Although it sounds sweet, the bow does not have the strongest sound, and thus it may be better suited for a collector or a second bow bow.